Yes of course you can add your own personalised gift message during the checkout process in the delivery method section. This message is printed on the top of the delivery box at the bottom of the delivery label. Most of the time the gift message is also be included inside the box. When will my hamper be delivered? You can track your order at any time after ordering. For standard free delivery your hamper will be despatched immediately and delivered within 2-3 days exclusing weekends and bank holidays. For pre-Christmas delivery (if available) your hamper will be delivered between the 12th and 23rd December. You can also select an exact date for free delivery, this is ideal for named day and next day services. You can also select Saturday delivery for a small extra fee. Some locations may have a less delivery options and this is shown during the checkout process. Can I send my hamper overseas? We have two options for international delivery. 1) Send a hamper from the UK and pay the applicable international delivery charge for your delivery countries location. Delivery will be made on the date selected and will show this on your order confirmation. 2) Find an Item marked 'Free Delivery' to your delivery location. The stock for these items is already in the delivery country, so can be despatched immediately and delivered fast to your recipient with a few days. I have received a discount code, how do I apply this? You will be given a chance to add this voucher code to your order on the "shopping basket" page, before proceeding with the checkout. You can go back to this stage at anytime without losing your order. Is there a receipt or price in the box, I don't want them to know how much it was? We understand that most of the time our hampers are bought as gifts, therefore we do not add any receipt or documentation inside the box apart from any gift message you have completed at checkout. All receipts and invoices are emailed to you only. Where is my Gift Message? 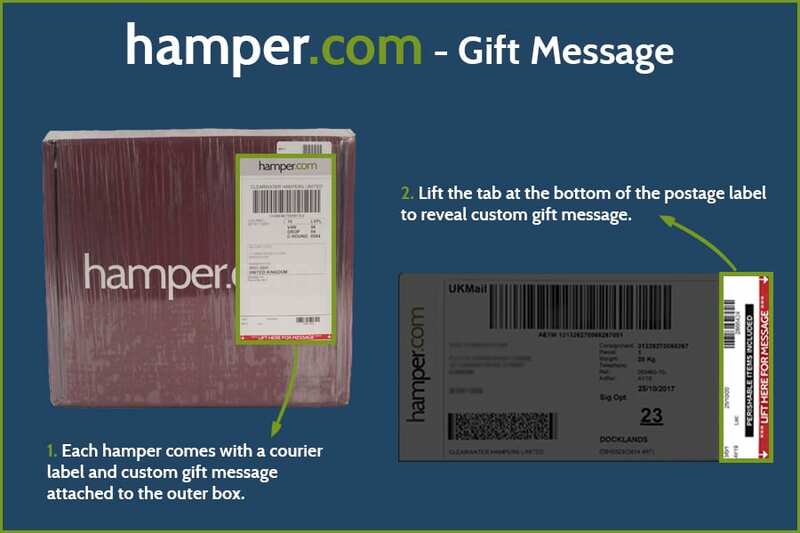 If you added a gift message at checkout, it is printed underneath the delivery label (courier info) on the delivery box, it is visible on the top of the box in a clearly marked bright red section with the words 'LIFT HERE FOR MESSAGE'. We use a variety of couriers based on the size and weight of the parcel and the delivery location, these include DHL, DPD and UK Mail. If the recipient is not at home when a delivery is attempted the driver is authorised to either try a neighbour or to leave the parcel in a safe place – if it is appropriate and safe to do so. If the parcel is not signed for at the delivery address, then the driver will leave a calling card noting if the parcel has been left with a neighbour, a safe place or returned to the couriers local depot – details of which will be on the calling card. A second delivery attempt should be made on the next available working day. Can I request a delivery to be made in the morning, afternoon or evening? Unfortunately, due to our courier’s volume of deliveries, specific times cannot be requested, however deliveries are generally made during working hours – extended in to the evening during busy times. Saturday delivery to UK mainland addresses is available for an additional fee, we do not currently offer a Sunday delivery service. Can you deliver to BPFO addresses? We are not currenty able to deliver to BFPO address. Why are your overseas delivery prices so high compared to those in the UK? Delivery is free in the UK – but for those going outside the UK, we have to add on the additional cost that international delivery companies charge us for overseas delivery including surcharges and customs charges. We deliver all international deliveries through DHL as although they may not be the cheapest, they are very reliable, safe and fast with all deliveries made using their Express Air Service within a few days, compared to many competitors that use ground services which takes much longer and may result in spoilt food. The cost of delivery is based on the size and weight of the parcel as well as the destination, and so the prices vary from hamper to hamper. Although they may seem high, they are actually far lower than it would cost a private individual to send a parcel of the same weight and size overseas. Why does it cost more to send a hamper to Ireland and the Channel Islands – aren’t they are both part of the UK? Although Northern Ireland (with postcodes starting BT) is part of the UK, Southern Ireland (Eire) is not. The Channel Islands are part of the UK – but not from a delivery perspective where they are classed as EU Europe due to the parcel still having to clear customs on arrival. If I order more than one hamper do I get it any cheaper? All our hampers have been designed to fit the packaging as snugly as possible to prevent damage in transit, so making changes is not possible as the additional or alternative items may not fit. We also pre-pack non-perishable hampers, and again this makes changing items an issue – we do however have our Create Your Own section where you can tailor-make your own hamper. Why can’t I send my Create Your Own hamper outside the EU? Customs restrictions mean that certain items cannot be sent outside the EU without causing significant delays to the delivery, and as such we have restricted the service to hampers being sent to the UK and EU Europe only. I found some items I like in a standard hamper but they don’t seem to be available in the Create Your Own section – why is that? Not all items are included in the Create Your Own section, as we may be low on stock of that item. Normally If we are out of stock on our standard hampers we may substitute any item within the contents that is unavailable upon picking with a similar product of the same or greater value. We avoid doing that for Create Your Own hampers as we are aware that you have put time and effort into picking the perfect contents! Simply drop an email to office@hamper.com with your request quoting your order reference – and we will do the rest. Please contact customer services and we'll be glad to help.